Quick Review: More than anything, Tom Raines wants to be important, though his shadowy life is anything but that. For years, Tom's drifted from casino to casino with his unlucky gambler of a dad, gaming for their survival. Keeping a roof over their heads depends on a careful combination of skill, luck, con artistry, and staying invisible. Gripping and provocative, S. J. Kincaid's futuristic thrill ride of a debut crackles with memorable characters, tremendous wit, and a vision of the future that asks startling, timely questions about the melding of humanity and technology. Detailed Review: I couldn't believe my eyes when I read the book. It was entirely sci-fi, interesting and absolutely out this world (literally). It was something that I had never expected. Like the blurb above, I mean 'fighting in space?' The story was very fluid and easy to understand which makes this a good read. At the start, it's quite boring but don't stop until you've got a taste of the sci-fi action because they'll be wayyyy more things you'll wanna find out before you close that book! The story opens to a boy of fourteen called Tom. He's a boy who loves playing games and is interestingly good at them. The games are completely virtual so it's like you're actually part of the game. We find out that Tom is supposedly ugly, pimply and short. During this, he still has to go to school, virtually. You can even choose an avatar to log in. But Tom chose himself as an avatar. I had an absolutely fun time reading this book. We start to learn about other characters whom he meets. They're entirely and yet overly fun. Tom gets recruited by a commander who has decided that Tom can be cruel when he wants to be. After recruiting Tom, he gets a taste of Insignia. An army that fights in space virtually, implants microchips into brains, improves looks and heights, makes your brain calculate faster than normal. Now, who wants to be normal? The story is during World War Three! Where the military recruits teenagers to serve as soldiers because of the implanted device in their heads. Why? Because if one of these microchips gets implanted in an adult's brain, it gets fried and corrupted. '"Do you want to be somebody important?" Tom leaned back in his seat and tipped his drink to Heather-and the man who had just won this match. Because, more than anything, Tom wanted to do something. Something other than move from casino to casino, something other than turn into his dad. Now, we learn about the real Tom and what he really wants. Then we learn about things like training and the brain. I thought the storyline was hilarious and awesome where space and time possibly existed on Earth so frequently. Tom learns about his abilities to fry people with electricity, break down satellites and connect with an electronic device. He learns about his new enemy. A girl behind the name of Medusa. She's supposedly the world's most powerful and influential enemy yet-no one's seen her face. Except the avatar she hides behind. 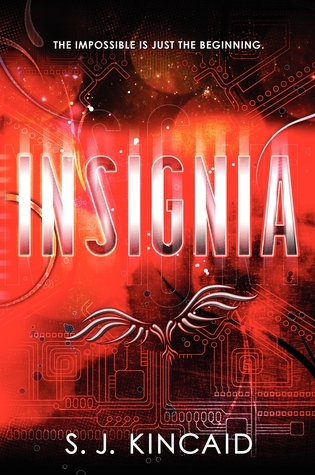 Tom gets obsessed with the idea of a girl being more powerful than anyone at Insignia. He later contacts her and fights with her. At the same, falls in love with her! They train together and learn about more things that shouldn't have told each other. What can he say? He wanted to be important... - whoops very important spoiler that I can't say. I guess you'll have to buy the book to find out. I think the story was actually quite impressive and quite different in many ways. S. J. Kincaid has captured the essence of a sci-fi, thriller series. The next book would be worth the read and I'll be looking forward to it being on my shelf. Hi! Thanks for following us. We'll be following you back!